African continent supports rich wildlife across its deserts, savannas, huge valleys, and forests. Africa is home to the largest land animal (African elephant) and the tallest animal (giraffe) in the world. There are many other cool African animals you would be interested to know. Here the list of 10 amazing animals found only in Africa. Greater kudu is an amazing antelope that native to Eastern and Southern Africa. They inhabit in savannah woodlands and rocky hillsides. Greater kudus are one of the longest-horned antelopes in the world. The impressively twisted horns only found in male kudus. Their horns can grow over a length of 1 meter with 2 and 1/2 twists. Male kudus use their long horns to defend against its predators. The male greater kudus have a body length between 2-2.5 meters and weigh up to 315 kg. The female kudus are smaller than males. They measure 1.85-2.3 meters in length and up to 215 kg in weight. Greater kudus have a brown-grey coat with 5-12 vertical white stripes. They also have a distinctive white band between the eyes. Greater kudus are social animals. The female kudos form groups that contain up to 25 members. The male kudos only join in the groups during mating season. This larger species of antelope mainly feed on leaves, grasses, fruits, and flowers. In the wild, greater kudus live up to 7 years, and in captivity, they can live over 20 years. The flightless ostriches are the largest bird in the world. They have a length between 2-2.7 meters and weigh up to 160 kg. Ostriches live in savannas and desert lands of Central and Southern Africa. Ostriches are also known as ‘camel birds’ because they can withstand high temperature and can live for an extended period without water. 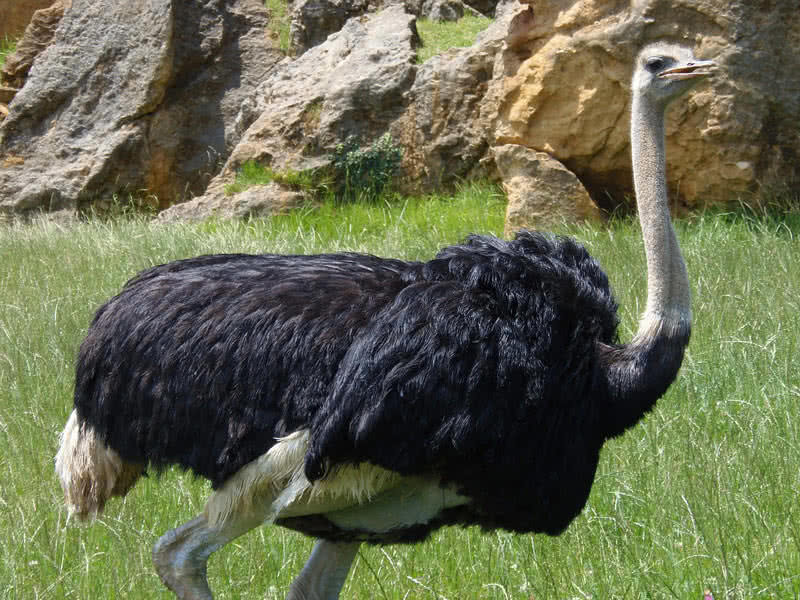 The soft and smooth feather of adult male ostriches come in black color, and their tail is white. Unlike the male ostriches, the female has a greyish-brown feather. The neck of ostriches is long and bare. With powerful long legs, ostriches can reach up to a maximum speed of 43 miles per hour. Each two-toed foot of ostriches has very sharp claws. Their legs are sturdy enough to kill a human with a single kick. Ostriches used their legs as a primary weapon to defend against the potential predators like lion, leopards, cheetahs, and hyenas. Ostriches live in small herds that contain 10-12 members. At 15 cm in length, Ostriches lays the largest eggs in the world. Ostriches are omnivorous, and they feed on leaves, roots, seeds, lizards, insects, and snakes. They also swallow pebbles and small stones to grind up the food in the stomach. Okapi is the only remaining relative of giraffe in the world. They only found in rainforests of the Republic of Congo. 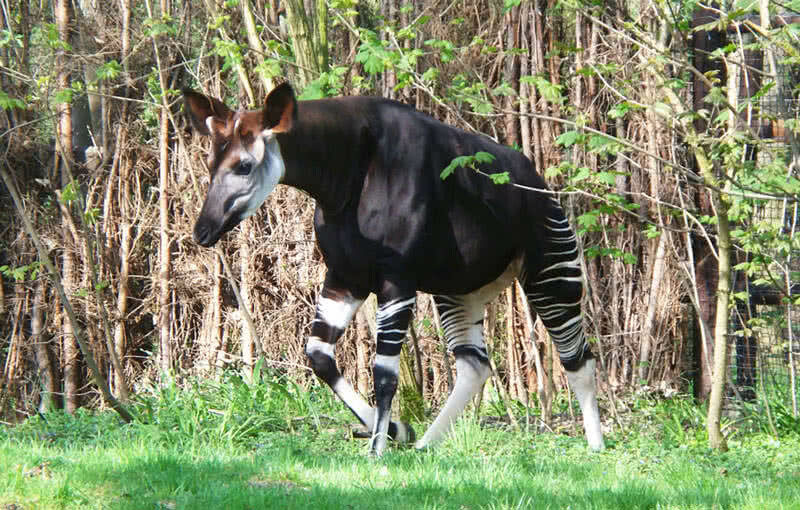 The most prominent feature of okapis are the striped markings on their behinds that give them a zebra-like an appearance. Okapi is one of the most endangered animals of Africa. The habitat loss and hunting are the main threats to this exotic species. Okapis can reach up to 8 feet in length and weigh between 180-310 kg. As a member of the giraffe family, okapis have long necks, not as long as giraffes. Their coat is reddish-brown and has zebra-like stripes on hind limbs and front legs. It helps them to blend in dense forests easily. Okapis also have a very long tongue which can reach up to a length of 18 inches. Okapis often travel 0.8-2.5 miles per day in searching for food. Their long tongue helps them to strip the leaves from buds to the plants easily. Okapis have scent glands on each foot which produce a tar-like secretion. They used it to mark their territory and to communicate with each other while going for long distances in searching for food. Galagos are also known as bushbabies, a small primate which has a length between 6-8 inches and weighs up to 10 oz. They live in bushlands and woodlands throughout East Africa. The thick fur of galagos comes in brown or grey. They have huge ears which can fold to give them an excellent sense of hearing. This nocturnal creature also has excellent night vision with large eyes. The small galagos are remarkable jumpers as they have powerful hind legs. On a single leap, galagos can reach up to a height of 2.25 meters. Unlike other primates, galagos have an additional tongue that is hidden under the primary tongue. The nocturnal galagos spend most of their time on trees. The flexible joints on their legs let them move between the branches easily. Galagos mainly feed on tree gums, fruits, and insects. 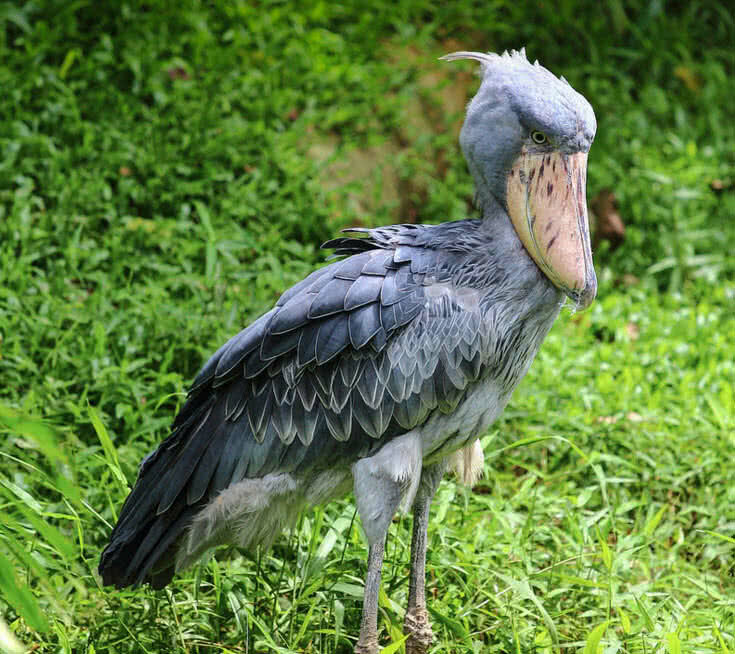 The shoebill is one of the most strange looking birds in the world. They named after their large shoe-like bill which can grow up to a length of 9 inches. This amazing bird can be found only in the swamps and marshes of Eastern Africa. Shoebills are one of the species that likely to become endangered in the near future. Habitat loss and hunting are the main threat to the shoebills. The large shoebills can reach up to 4 feet in length and weigh between 4-6 kg. They have bluish-grey plumage and broad wings. The large, strong brown bill of shoebills ends with nail-like hooks. Shoebills are ambush predators which mean they remain motionless until the preys approach them. Then they will make a sudden attack using their powerful bill. The diet of shoebills mainly consists of lizards, turtles, water-snakes, and rats. The large shoebills possess a maximum flap rate of 150 flaps per minutes, one of the slowest among the species of birds. It is one of the most solitary birds in the world. They come together only to breed. The mantled guereza is among the most attractive African monkeys. They have beautiful glossy, black and white fur and an impressively long tail. 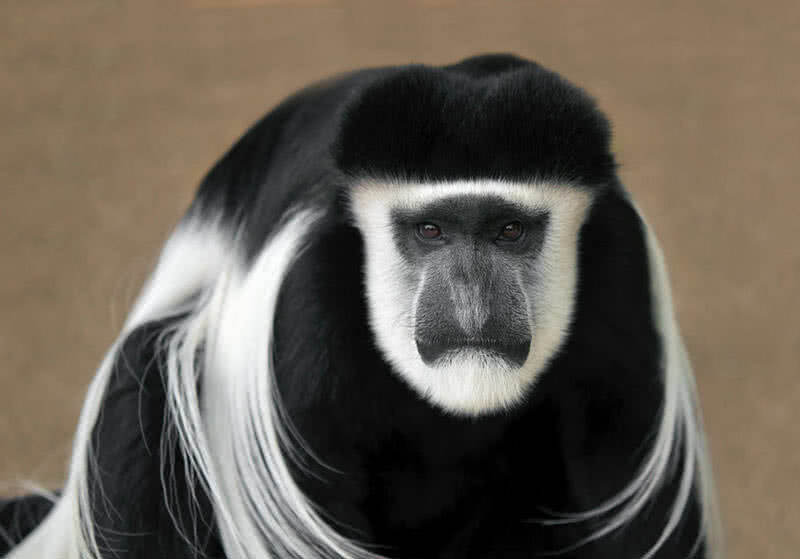 Mantled guerezas are also known as guereza or black and white colobus. They inhabit in deciduous and evergreen forests of West-central and East Africa. Guereza is a large species of monkey that have a length between 21.2-28 inches and weigh up to 13.5 kg. Guerezas live in small groups that contain 3-15 monkeys. These monkeys are active during the day but spend their most time on trees. They also utilize daytime to find food sources. Guerezas produce different types of calls to communicate with each other. The multi-chambered stomach of guerezas has specialized bacterias which help these monkeys to digest a large amount of food. The diet of guerezas mainly consists of leaves, seeds, fruits, and arthropods. Standing at the height of 1 meter and weigh over 4 kg, the grey-crowned crane is a large bird that inhabits in savannahs, rivers, and marshes of Eastern and Southern Africa. The most prominent feature of this fantastic African bird is its crest of golden feathers. The plumage of grey-crowned crane is mainly grey with pale-grey neck and black and white wings. They also have an attractive bright red pouch below their beak. The courtship display by the grey-crowned cranes is one of the best among the species of birds. They dance, jump and produce interesting calls to attract the mate. With 2-5 eggs per nest, the grey-crowned cranes produce the largest average clutch than most of the other birds in the crane family called Gruidae. 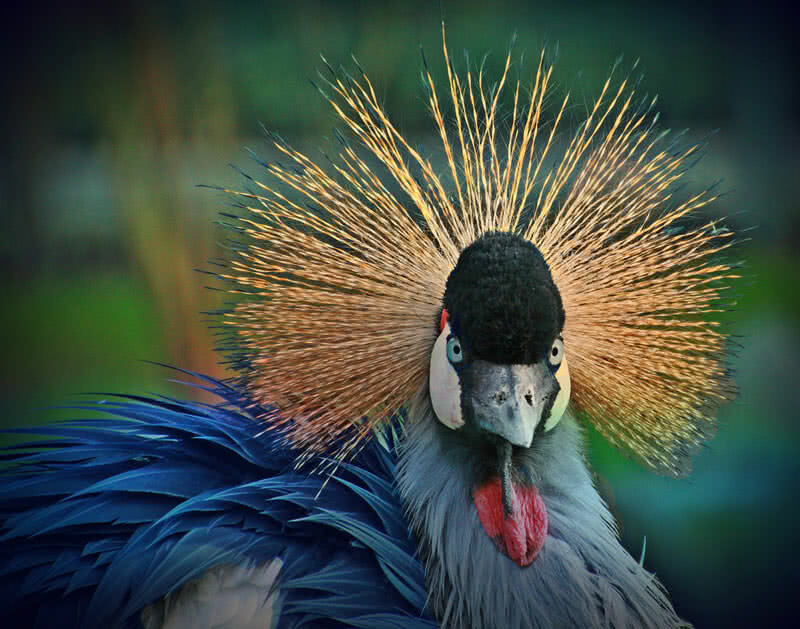 Grey-crowned crane is an omnivorous bird that feed on insects, lizards, grasses, seeds, fishes, and amphibians. 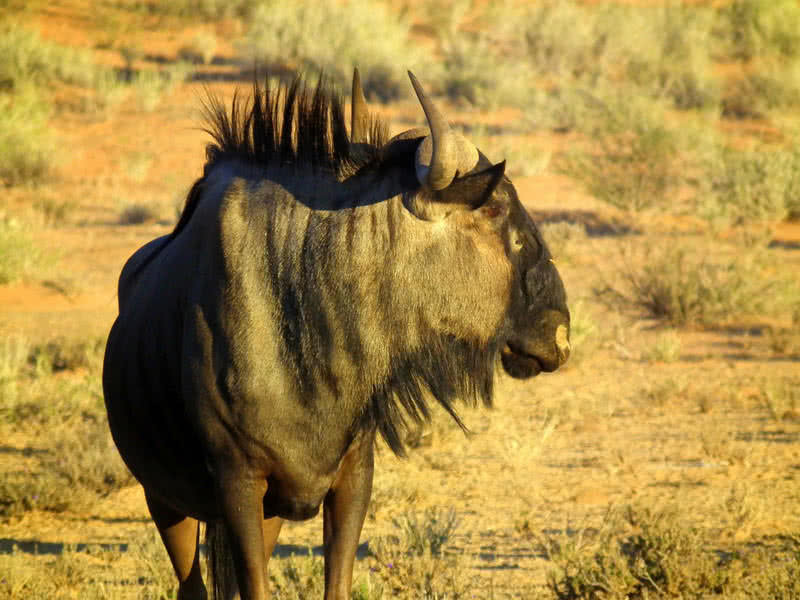 The bull-like looking wildebeests actually belong to the family of antelopes. There are two different species of antelopes in the world – black wildebeest and blue wildebeest. Both species of wildebeests are found only in Africa. They inhabit in open woodlands and green plains. Wildebeest can reach 8 feet in length and weigh up to 275 kg. Both male and female wildebeests have horns. They live in large herds. Between May and June, when food sources become scarce, the wildebeests migrate towards North. The migratory group consists of 1.2-1.5 million wildebeests. Thousands of zebras and gazelles also accompany them. It is the largest terrestrial mammal migration on Earth. A wildebeest can cover over 30 miles in a single day. During migration, they travel between 600-1000 miles. Wildebeests are grazers, and they mainly feed on short grass. Lions, cheetahs, hyenas and wild dogs are main predators of wildebeests. Mandrills are the largest species of monkeys in the world. They have a body length between 25-34 inches and weigh up to 38 kg. 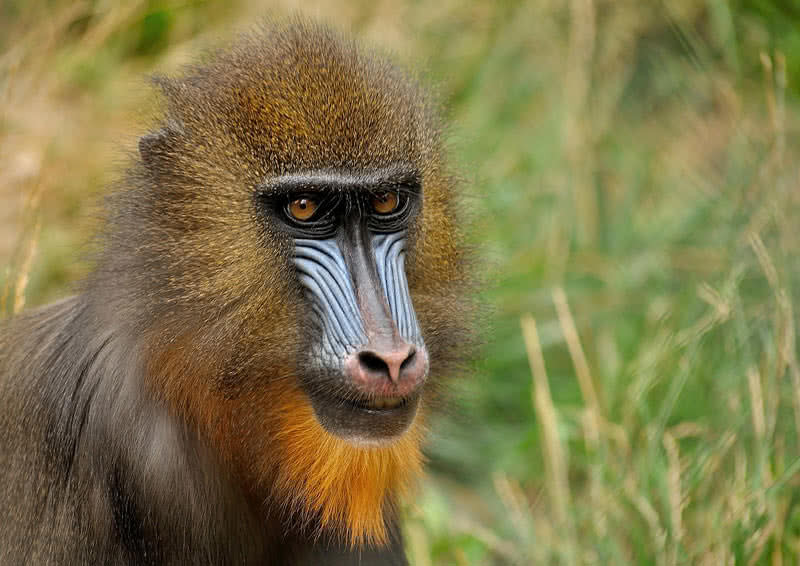 Mandrills live in rainforests and subtropical forests of Western-Central Africa. Mandrills are definitely among the most colorful monkeys in the world. They have beautiful dense, olive green fur and grey underparts. The cute long nose of mandrills features a red stripe. They also have distinctive blue colored rumps. The male monkeys are larger and colorful than the females. Mandrills are an extremely social animal, and they live in large groups that contain up to 200 members. Apart from the coloration and size, the long canine teeth is another great thing about mandrill monkeys. It grows up to a length of 2.5 inches. Mandrils use their huge canine teeth to threaten the predators. Mandrills are active during the daytime. They have cheek pouches to store the food they collect. They are omnivorous and feed on fruits, seeds, insects, eggs, and worms. Lemur is a fantastic primate that found only the Island of Madagascar, in the East coast of Southern Africa. 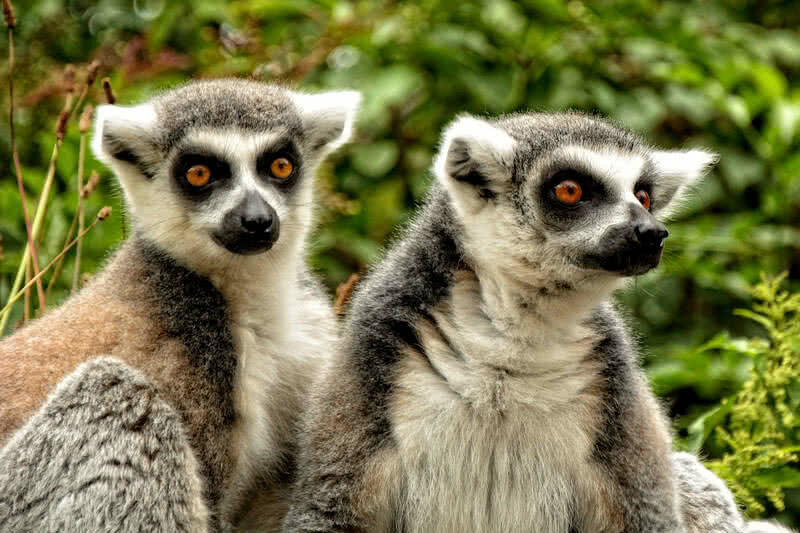 There are 30 different known species of lemurs in total, and all are endemic to Madagascar. The Madame Berthe’s mouse lemur which weighs only 30 g is the smallest primate in the world. The Indri or Babakoto is the largest living lemur which weighs up to 9.5 kg. Most lemurs are arboreal, which means they spend most of their time in dwelling on trees. The tail of most species of lemurs is also longer than their body. Lemurs are social animals and live in groups. Lemur use high pitched calls and scent markings to communicate with each other. They have an excellent sense of hearing and smell. Lemurs are one of the most intelligent animals in the world. They are known for using tools and can learn patterns. The fossa is the only natural predator of lemur. The diet of lemurs consists of fruits, nuts, leaves, and flowers.